The forest industry turnaround has started in one of B.C.’s most forest industry dependent-communities—Mackenzie—and in a very welcome move, people are being recalled back to work at the sawmill. About a year ago, a popular restaurant in the town of Mackenzie in the B.C. Interior was acquired by new local ownership. They named it “The Turn”. That’s as in turn around, get back on track, the beginning of something new and positive after multiple local mill closures had sent Mackenzie into an economic tailspin. 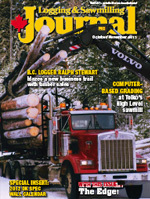 Near the north-central British Columbian town, one of those closed down operations—Abitibi Consolidated’s two sawmills and paper making complex—was acquired by Conifex Timber Inc. And this new company, too, is turning things around, hiring people and inviting them to share in something fresh and positive in wood fibre utilization. That phrase—wood fibre utilization—is key in the Conifex vocabulary. With the majority of its cutting licence volumes located north of Mackenzie, Conifex uses Williston Lake (left) for more economical log transportation between ice out and freeze up. 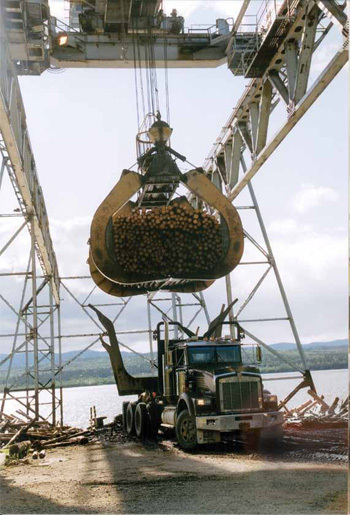 The logs are then delivered by truck to the re-opened sawmill operations of Conifex in the town of Mackenzie. Conifex’s quality wood basket, its two sawmills, a wood fired bioenergy plant scheduled for commissioning in 2012 and a timetable for upgrades and expansions contribute to the company being bullish about the long term future of its Mackenzie operation. Conifex’s owners had a clear vision of that potential when they acquired the Mackenzie site in 2010. It had been down for about two and a half years, victim to the recession. “We had to spend some money to get one of the sawmills and planer operational and bring maintenance levels back up to operate on a single shift,” relates Federink. A second eight hour shift in both mill and planer came on stream March 2011 and by the end of September, a split shift was implemented. The upshot of that was the complex operating 100 hours a week and hiring 20 to 25 new full time employees. It was gratifying for Conifex that more than half the names on the hourly workers recall list (200) were either still available in Mackenzie or chose to come back. “We’re finding very good resumes both in and out of town,” reports Federink. He says recruiting received a boost from the announcement of the operation’s power plant component. Employees liked that there was something new in the mix, it wasn’t just the same thing, he adds. Wood fibre utilization is a key phrase in the Conifex vocabulary, says Arnie Federink (left), Conifex’s general manager in Mackenzie, with the wood itself helping to determine its best end use. 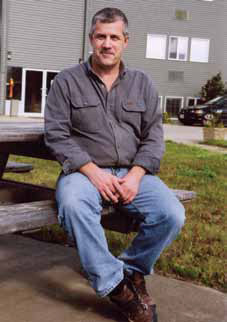 It may lend itself to conversion to lumber in the company’s sawmill operations or for use in bioenergy. Below is the site of the company’s $50 million bioenergy plant in Mackenzie. Conifex has been diligent preparing for its growth. Apart from hiring the tradesmen it needs, the company has launched electrical, mechanical and heavy duty equipment operator apprenticeships to encourage participation of the next generation of workers. 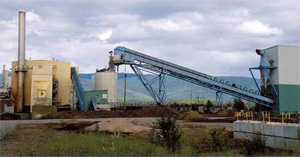 Conifex Mackenzie occupies a large industrial site adjacent to Williston Lake with plants in two separate locations. The company is refocusing and upgrading the assets it needs and disposing of the others. Federink anticipates one of the first capital upgrades will be required in 2012 at the Site 2 planer. He expects the capacity-increasing project will include installation of automatic grade sorting, an increase in lug speeds and improved lumber stacking capabilities. Federink reckons the primary breakdown lines in the two sawmills Conifex acquired are in reasonably good shape. Eventually, the company sees three sawmill lines, two planer lines, the bioenergy facility and possibly a wood pellet manufacturing plant as parts of a coordinated Mackenzie operation. The existing dry kilns are generally older but most are still doing the job required, for now, he adds. Along with the production of standard dressed lumber for North American markets, there is a rough green sort for China. Conifex has plans to increase value through heat treating and packing for the Chinese market. “We are also exploring marketing possibilities with other wood products,” he says. With the majority of its cutting licence volumes located north of Mackenzie, Conifex uses Williston Lake for more economical log transportation between ice out and freeze up. Federink says the goal is to dump, boom and tow about 300,000 cubic metres to Mackenzie before the end of October. The mountain pine beetle epidemic gripped the north Mackenzie region about five years ago and those volumes are targeted for harvesting. The longest tow takes about 10 days with a target volume of 25,000 cubic metres. It takes approximately another 10 days to dewater, using a crane to service three logging trucks with specially configured bunks (about 70 metres/load) working the short haul from the dewatering station to the appropriate mill yard. With Conifex joining Canfor’s operations in Mackenzie and secondary manufacturers like East Fraser Fibre Co., the industry that built Mackenzie is now adding the needed momentum and investment to lead in its economic turn around.